"In these, the twilight years of the nineteenth century, I amazed at how high mankind has soared, and at how deep it has fallen, because of the myriad advances in our sciences and in engineering. Seldom does a day go by without a gentleman announcing his newest life-changing invention, each claiming it will benefit mankind in some way. “It is a pity that we, the leaders of the civilised nations of the Earth, could not have put these marvels to better use. May God have mercy on us all." Robert Delamere, Lord Conway and Prime Minister 1893-95. It is 1895 and the world is in turmoil. In the decades to come historians will reflect upon the cause of this state of affairs and many will point at Charles Babbage. His perfection of his Difference Engine and then his Analytical Engine gave the new scientific establishments in the great imperial nations the tool they had so long needed in order to make a great leap forward. The ability to make huge and repeatable sets of complex calculations revolutionized the world. Within twenty years we had the perfection of miniaturized steam engines, electric light and motors, Radium Bricks, Arc weapons, Hydrogen and latterly Helium Dirigibles, Road Trains, Calculating Artillery Engines, Sea and Land Dreadnoughts and, well, the list is almost endless. Nothing is impossible when the wealth of a great nation is coupled to the unlimited imagination of educated men of science and their engineers. The one thing that all these marvellous advances has not brought is peace. Every Great Power has been jostling its neighbours for resources and more importantly, the latest technology. None can afford to stand still and allow its neighbours to advance their science and engineering unmolested. If they do they risk being overwhelmed as the French were in 1861 by the Prussians with the first Mobile Calculating Artillery Engines, or the Northern Americans in the year after that, as their ports were put to the flame and successfully blockaded by the South's Armoured Sea Dreadnoughts. Some nations have also been tapping into spiritual and psychic powers as well, in order to produce an unholy combination of the mystical and the mechanical, such as the ghastly Prussian Tod-truppen. Although there have been relatively few open conflicts between the Great Powers, there is a state of undeclared and secret war between them all. This is where the Adventuring Companies come in. These are the deniable clandestine agents of the Great Powers (and of other globe-spanning organizations). They act in the shadows pitting their skills, their wits and the newest technologies against each other to obtain the latest scientific formula, artefact or other vital component. Small groups of highly skilled and specialized operatives are brought together for each mission under the command of a trusted 'Captain'. In Great Britain they work directly for Her Majesty’s Government or out of the Explorer's Club in London’s Pall Mall. In Prussia their patron is the highly secretive Thule Society, and in the USA they are mostly sponsored by the Secret Service. There are similar organizations in each of the Great Powers. They all have the choice of their nation's latest arms, armour and other equipment with which to perform their missions. 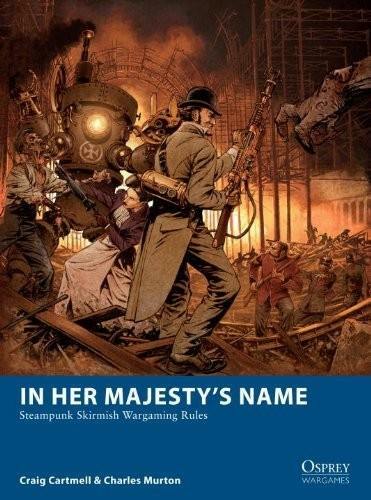 The game of In Her Majesty’s Name pits these small Adventuring Companies against each other in skirmish battles which may be single encounters or part of longer narrative campaigns. The rules are quick to learn but have sufficient depth to give a satisfying evening’s entertainment.